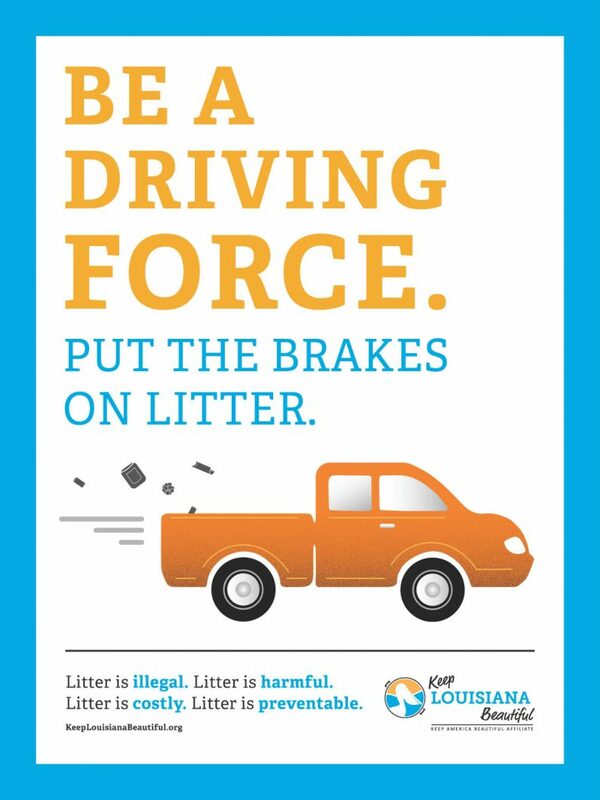 Be a driving force for a litter-free Louisiana. To reach drivers, this campaign will focus on the two places through which every driver must pass: a driver’s education school, and the Office of Motor Vehicles. The Louisiana Driver’s Education handbook will now include a page dedicated to preventing roadside litter, and the information presented will be part of the computerized test that each driver must pass before receiving his or her license. In addition, each Louisiana Office of Motor Vehicles will be adorned with a window cling, a wall poster, desk mats and table tents that reemphasize those four key points about litter. Every Friday of the month, employees at the Louisiana Office of Motor Vehicles will wear t-shirts that bear the same message to show that they stand with Keep Louisiana Beautiful in our stance against litter. Litter is Harmful. Litter is Costly. Litter is Illegal. Litter is Preventable.